This beautiful lower cottage house is situated in the town of Airdrie. There are 3 bedrooms, two with twin beds and one with a double bed, all decorated to a high standard. All linens and towels will be provided. There is an separate, well-equipped kitchen available for guest use, as well as a reasonable sized bathroom that offers all of the essentials, including an electric shower. 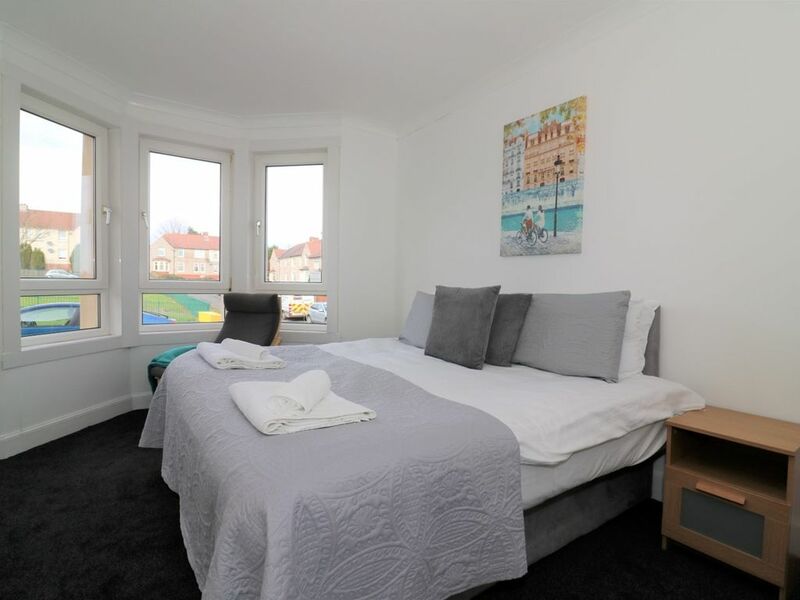 The apartment is situated in the heart of Airdrie town centre, providing a great location to access many popular local restaurants and bars in just a short walk. There is a Morrisons and a Tesco Superstore within walking distance of the property, as well the local retail park. Drumpellier Country Park is very popular amongst locals and visitors alike, also just a short drive from the apartment. There, you will find a boating pond, a visitor centre with cafe, and much more! There is also Airdrie Leisure Centre nearby, offering a pay as you go gym, with a running track and spin fit studio. There are great transport links right on your doorstep with trains to Glasgow in under 40 minutes, and trains to Edinburgh in under 60 minutes.